Resolution to close the case – one of the most cited documents of the Criminal Case. This is the document that explains the cause of the death of the group with an "overwhelming force, which the hikers were unable to overcome". This is the document that allows all opponents of the criminal versions to use the phrase “no traces of outsiders” as an argument. I suspect that it was this document that formed the basis of the “controlled environment” theory by Alexey Rakitin, in which he makes Georgiy Krivonischenko as one of the “main characters”, suggesting that one of his clothes was specifically contaminated with radiation (the famous “Krivonishchenko pants”) . It is this document that discredits earlier (often less well known to not so advanced researchers) documents and statements. And in this regard, this document deserves a very careful attention to itself, attempts to analyze almost every phrase, comparison with other sources. Moreover, there are 3 variants of this document and they all differ from each other. what information are investigator Ivanov's conclusions based on? if there are discrepancies - does it discredit the other documents, or does it show Ivanov's negligence? how many “mistakes, omits or mismatches” with other documents are we talking about? if there is an attempt to hide something or divert the attention to something, to divert attention - is it possible to try to account for these moments? Because it is this document that puts an end to the investigation into the cause of the death of the group, and it was this document that was given to the relatives, not the rest of the documents of the criminal case. Here I will try only to identify the moments in this document that are unclear to me, to show the discrepancy with other sources and address the questions that arise personally for me. Agree or disagree with these questions, to try to find answers can every reader on their own. I decided to merge all 3 versions of the Resolution in one text, so that the logic of the document change could be seen better. Such fragments will be highlighted in red. If this phrase is absent in the final version, it will be crossed out. In brackets I will indicated in which of the draft versions it was present initially. With an asterisk (*) I will highlight the exact phrase or semantic fragment to which my comment will apply. If there was a transfer, why is Ivanov conducting observational proceedings in a case that he is leading? The group consisted of: Igor Dyatlov - a student of the Ural Polytechnic Institute, leader of the expedition; Dubinina L.A., Kolmogorova Z.A., Kolevatov A.S., Yudin Y.E., Doroshenko Y.N. - UPI students; Zolotaryov A.A.* - Instructor of the Kourovka Tour Base, Slobodin R.V., Krivonischenko Y.G., Thibeaux-Brignolle N.V. - engineers of enterprises in Sverdlovsk and Chelyabinsk. Zolotaryov initials are wrong. In all 3 versions of the resolution. This is also the case in another document - the protocol of forensic medical examination. Both documents are procedural. There is a question about the identification of Zolotaryov. However, in non-procedural documents (like the receipt of Semyon’s mother receiving his belongings), the name of Zolotaryov is stated quite correctly. So Ivanov knew what his name really was. It can be added here that Zolotaryov's initials are wrong in the well-known protocols of the city committee and the regional committee of the CPSU, on the plate on the monument. All the participants of the expedition had good hiking training and could participate in a trek of III category of difficulty*. The group was supplied with the necessary equipment and food, the trade union committee of the Ural Polytechnic Institute financed the expedition. There is no data on the hiking training of the participants, even in such documents as the project of the expedition and the report of the Moscow experts. Especially the question of preparation was supposed to concern all the same Semyon Zolotaryov. Semyon Zolotaryov was approved twice - first in Sogrin group, and then in Dyatlov group. However, it later turned out that none of the commission members (including Maslennikov) had ever seen him personally. There are no documents stating Zolotaryov's qualification either. The diaries are not giving us a definite information about where and whether they built a storage. It can be assumed that the investigation saw the storage marked on the sketches the group made and probably found among the items in the tent - this explains how easily and quickly it was found on March 2. But at the same time, on February 25, in the canister dropped by Slobtsov group, a clear instruction was given to “search for a storage site”. So how did the search party knew about the storage if the tent itself was found on February 26th? The start of the ascent - see "photo examination"
There is no data confirming that the ski trail belongs to the group. Moreover, according to the recollections of Slobtsov (the person who found this ski trail), they could not even determine the direction of movement along it (up or down), since there were no traces of poles. the trail was left 31 Jan 1959 before making the first attempt to go over the pass. It doesn't reflect the movement of the group on 1 Feb 1959 and shows just the right direction to the pass. this ski trail ended before the pass and the slope; Slobtsov group went further in azimuth, and not on the ski trail itself. no ski tracks were detected on the ridge. And accordingly, talking about group movements can only be theoretically. Thus, there is no data for an orientation error; this can only be an assumption. 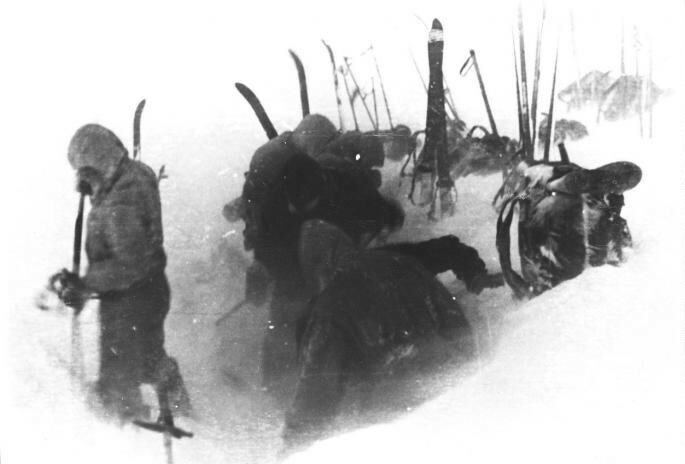 Using light day time to rise to the top of the "1079", in conditions of strong wind that is usual in this area, and a low temperature of the order of 25-30°C*, Dyatlov group found themselves at unprofitable conditions for spending the night and decided to pitch the tent on a slope of height "1079" so that in the morning of the next day, without losing altitude, go to the Mt. Otorten, to which the distance in straight line remained about 10 km. Even during searches, requests were made for weather conditions on the night of February 1st to 2nd. According to an extract from the journal of meteorological observations in Burmantovo (should have been provided to the investigation), the temperature on February 1 was -4 -10°C. Thus, Ivanov’s statement about a very low temperature down to -30°C degrees is not justified by anything, but only explains well "why everyone froze". In one of the cameras the last frame shows the moment of excavation of snow for the installation of the tent. Considering that this frame was shot with an exposure of I/25 seconds, with a diaphragm of 5.6 at a film sensitivity of 65 Un. GOST, and taking into account the density of the frame, we can assume that the hikers started the installation of the tent around 5 pm* 1.II.59. A similar picture was taken with another camera. Note: it is precisely this 5 pm that the countdown of when they left the site of the last stop is based: “Dyatlov, as the head of the group, made a gross mistake*, expressed in the fact that the group began the ascent of I.II.59 only in 15-00"
These photos belong to the category of "loose photos", the source is not known. They are NOT part of the criminal case (and they must be, if they were examined), the frames are NOT from any of Dyatlov group members films. In the materials of the criminal case, there is NO document of the examination for establishing the time when the pictures were taken, as well as there are no documents reflecting the state of the cameras. Thus, this statement of Ivanov is not at all confirmed by any of the materials of the criminal case. According to his characteristics, “shutter speed, aperture, ISO) in the script it is impossible to draw a conclusion about the shooting time, since the illumination is affected not only by the time of day, but also by cloudiness, poor visibility due to snow and so on. Assessment of the state of the tent causes a huge amount of controversy, because prior to inspection by the authorities, it was partially examined by the search party. Some of the items were taken from there by them and, possibly, returned the next day. It is also not known exactly when the investigators found out (or did they) about the fact that rescuers handles items form inside the tent. Location and availability of items in the tent (almost all shoes, all outer clothing, personal belongings and diaries) indicated that the tent was abandoned suddenly by all hikers at the same time, and, as it was established in the subsequent forensic expertise*, the lee side of the tent, where hikers usually laid their heads*, it was cut from the inside in two places providing a free exit of the person through these cuts. Ivanov gives 2 characteristics of the tent sides – A) "lee side" B) "where hikers laid their heads". In accordance with these characteristics, we are talking about the western slant, facing the rise, not descent. And from this it follows that the group through the sections “ensuring the free exit of a person” should have come up, not down the descent. According to the scheme of the tent attached to the act of forensic examination - the cuts are depicted on the opposite slant - the eastern, not the one about which Ivanov writes. Ivanov claims: as established in the subsequent forensic examination*, … turned out to be cut from inside in two places Ivanov assigns expertise of the tent on 16 Mar 1959. The tent comes to the lab 01 Apr 1959. Examination begins 03 Apr 1959 and finished 16 Apr 1959. However, on March 27, Moscow masters of sports (Bardin, Shuleshko) send their reports to the Central Committee of the CPSU and it already says that "experts have established that the tent is torn from the inside". What expertise do the masters refer to if the tent is not even delivered to the laboratory by this point? Does this mean that there were several examinations, or does this mean that the decision to "torn from the inside" was made initially, this was reported to the Central Committee, and the examination of April 16 only confirms this? Below the tent, for up to 500 meters* in the snow, traces of people walking from the tent to the valley and into the forest have been preserved. The traces were well preserved and there were 8-9 pairs. The statement about the length of the area of traces of 500m is not only not confirmed, but contradicts with other case files documents. 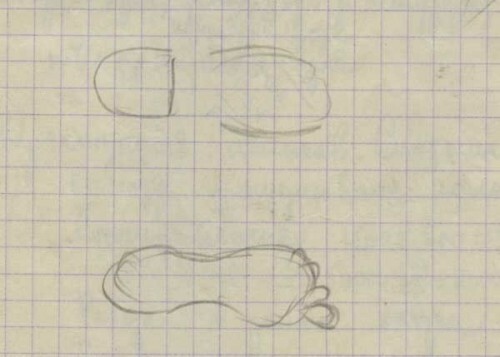 even Ivanov himself writes below, “Closer to the border of the forest, the footprints were covered with snow and disappeared.”, which corresponds to 1 km according to the schemes in the Case files. Inspection of the tracks showed that some of them were almost barefoot (for example, in one cotton sock), others had a typical footprint of felt boots, legs covered in a soft sock, etc. Prints of tracks were located close to each other, converging and again separated one from another. Closer to the border of the forest, the footprints were covered with snow and disappeared. Ivanov completely avoids mentioning the trace in the shoe. The footprint in the shoe contradicts the statement that there are no traces of strangers, since no member of the shoe group was wearing. However, the trace of the boot is clearly mentioned in the protocol of Chernyshov testimony. And sketched in Maslennikov notebook. Thus, it is more correct to say that in many areas, due to weather conditions, traces were not preserved in general. Including the group itself. Maslennikov in his diary, despite the "absence of traces," allows for the presence of strangers. 26.II.59 in 1500 meters from the tent, at the forest boundary, the remains of a fire are found, and near it were the bodies of Doroshenko and Krivonischenko, stripped to the underwear. At 300 meters from the makeshift fire, in the direction of the tent, was found the body of Dyatlov, 180 meters away from him - the body of Slobodin, and 150 meters from Slobodin - Kolmogorova body. According to Ivanov’s calculations, Zina’s body was found 870 meters from the tent, which is contrary to the protocol for inspecting the scene: In the same area, strictly in the south-west direction on the slope of height “1079” at a distance of 500 (changed from "58" or "56" - ed. note) meters from the body (later identified as Igor Alekseevich Dyatlov) was discovered a body of a female. Identified as Zinaida Alekseevna Kolmogorova. Besides the poses, it would be more revealing if they were trying to go back to the tent if there were any traces left, but non were noticed. XI – Ivanov "reduces" the length of the traces from 800-1000m to 500. 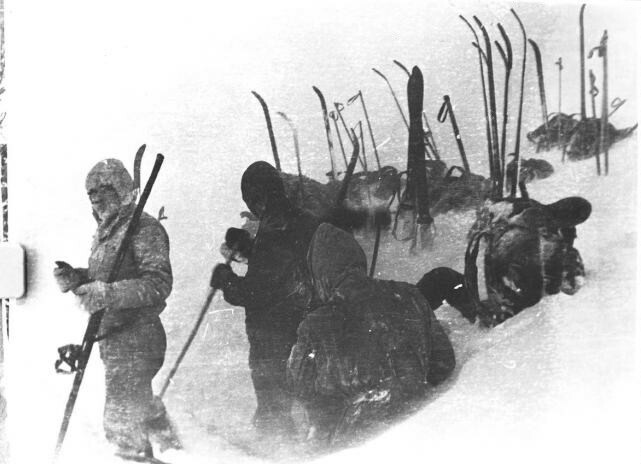 XIII – Ivanov "pushes" Zina away from the tent, from 500m to 850. Thus, Zina is no longer in the area of the footprints, which would follow from the Case files materials: Zina was found 500 meters from the tent, while the tracks were preserved for 800–1000m. According to Ivanov the tracks end at a distance of 500 m, Zina lies at a distance of 850m, where there are no footprints. The problem is that there were no traces of return (!) among the tracks, which should have been, if Zina was going back to the tent from the cedar. This is why Ivanov changes the distance. If he had followed the information from the Case files, it would have turned out that Zina had died only 500 meters down, and the group had left her body there. In this case, the descent from the tent at 500 m is clearly not enough time to freeze. Was Semyon wearing Lyuda's clothes? According to the autopsy report, Zolotaryov is wearing a “brown sport button-down jacket with a button”. And a "tarpaulin green fur jacket on sheepskin" is found on Tibo, which, according to the description, resembles Luda's jacket, which was not found in March. As for the cap, which also "turned out to be on Zolotaryov", in volume 2 there is a note written by Ivanov himself, that "the green cap is on Tibo". As for "Dubinina’s bare leg wrapped in Krivonishchenko’s woolen trousers"
Thus, the statement about the “woolen trousers” is not confirmed by any document and even contradicts the resolution on conducting the Resolution for radiological testing, written by Ivanov himself. Near the bodies, Krivonischenko's knife was found, which cut off the young firs near the fire. Finding a knife is not documented anywhere and is not reflected in any of the memories of search participants. The same Krivonischenko knife was not presented to relatives and was not returned to them. Unlike all other knives of the group. According to the autopsy report Kolevatov has "a wound of undetermined shape behind the right ear in the area of the mastoid process". Moreover, the conclusion of the Vozrozhdenny about death from hypothermia is not justified, since none of the signs characteristic of hypothermia is indicated in the descriptive part of the protocol. The cause of Kolevatov's death can be considered not determined. Physical and technical examination has established that Zolotaryov’s clothes, and especially Dubinina’s clothes, are significantly contaminated with radioactive dust. So the tatters from Krivonishchenko’s trousers that wrapped Dubinina’s leg (examination table №60)* gives 9900 half-lives per minute from 150 sq. cm, the belt from Zolotaryov’s sweater (examination table №2) gives 5600 half-decays, which significantly exceeds the rate of pollution permitted by sanitary regulations. Neither Zolotaryov, nor Dubinina worked with radioactive substances. This fragment is only in draft form and is completely absent in the Resolution of volume 1.
Who do the samples belong to? In the «Radiological Analysis Report» it is said. In the Certificate of Examination all objects of investigation are numbered from №1 to №4. As in the autopsy reports. In each of the autopsy protocols there is evidence of the clothes that were on the bodies. He attributes Kolevatov's sweater belt to Zolotaryov. He confuses what is Lyuda leg wrapped in, claiming that these are Krivonischenko pants. He attributes contamination clothes to Zolotaryov, although Zolotaryov is "clean"
He doesn't say anything about Kolevatov’s contamination, although 2 elements of his clothes tested radioactive, including the overalls that were removed from Doroshenko. He incorrectly attributes some kind of jacket to Lyuda, although Lyuda is not found in a jacket. Lyuda's jacket is on Tibo. "At the disposal of the expert to present all the clothes of Zolotaryov, Dubinina, Kolevatov and Thibeaux-Brignolle, as well as part of their bodies." We are aware of the expertise of only 10 samples. It is also established that the population of the Mansi people, living in 80-100 km in a few days distance (draft 1) from this place, is Russian friendly, offers hikers accommodation, assistance etc. The place where the group died is considered to be unfit for hunting and reindeer breeding in the winter. Considering the absence of external injuries to the bodies* or signs of a fight*, the presence of all the valuables of the group, and also taking into account the conclusion of the medical examinations for the causes of the deaths of the hikers, it is concluded that the cause of their demise was overwhelming force, which the hikers were not able to overcome. Multiple external lesions were found on each body, such as abrasions, wounds, hematomas, burns, etc., as recorded in the autopsy protocols. In the decision to terminate a criminal case on the fact of death there is not a single word about when did they die.